Many California wineries seem to view "retailers" as competitors and not as their ambassadors. There is not much "long range" wine marketing, it seems, here in California. Many vintners make decisions based on what's viable for the near-term, with little regard for long-term policies. One vintner, we're told, spends $50k annually with a PR agency so the winery doesn't have to "stoop" to selling its products in retail shops. Nice. We've been fortunate to sell some bottles of Peter Michael Winery wines since the winery released its initial offerings. We had tasted the wines when first marketed many years ago and found them to be of interest to some of our customers. Despite selling the wines of this estate for something like 15 or 16 years, the winery is "pulling the plug" on sales through retail shops such as ours. They see, with liberalized shipping laws, the opportunity to cash in and sell more of their wines directly to consumers at full price. Wine shops, then, are simply not valued as an integral part of the wine industry. 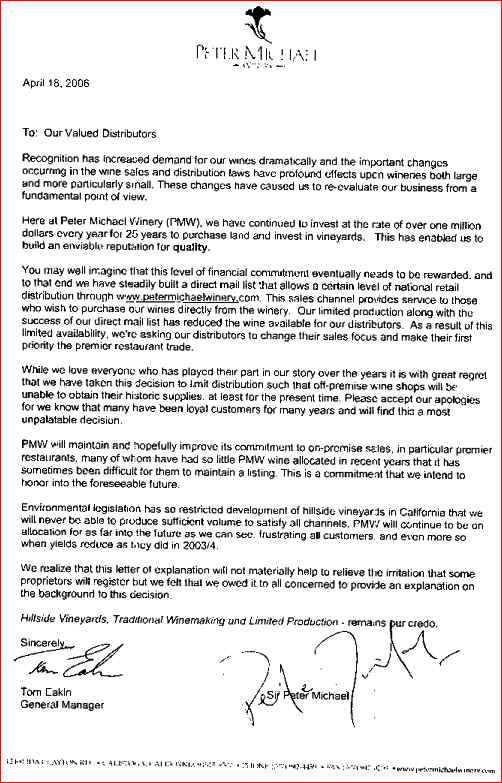 Below you will find the letter from the Peter Michael Winery which was presented to shops, having been photocopied by the very distributors who can no longer sell us the wines of this estate. 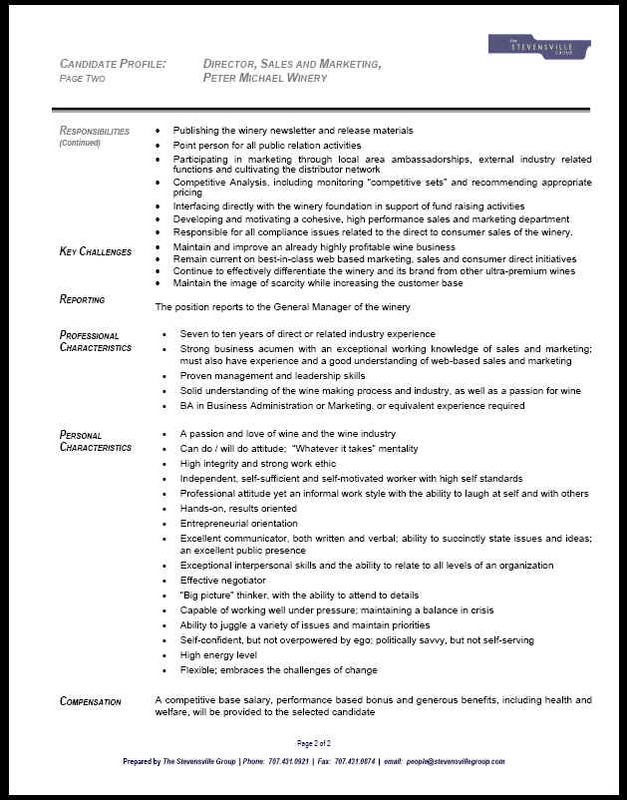 Following that is an interesting document seeking a marketing director for the winery. One of the priceless "challenges" to the successful candidate is to "maintain the image of scarcity while increasing the customer base." Have this little "behind the scenes" look at the world of wine marketing. It has been with great pleasure we have been able to offer some of our customers your various wines over the past two decades (since your first vintage, actually). 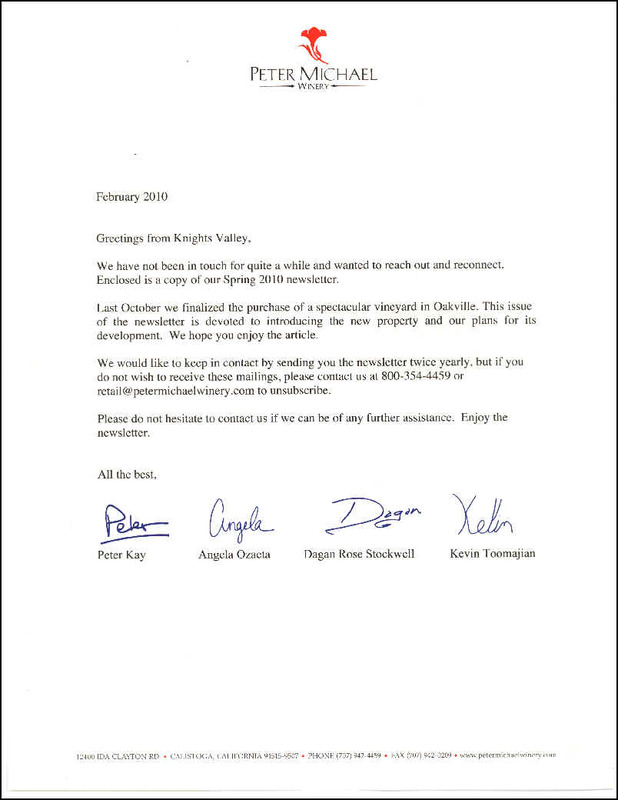 We were sad to receive a photocopy of a letter written to Our Valued Distributors dated April 18, 2006 . We are one of those beloved off premise wine shops you are banishing from your realm in favor of selling your wines directly to consumers now that the avenue for direct sales has fewer road blocks. We've appreciated the tiny allocation we've received from your lovely San Francisco distributor, Chambers & Chambers. We recall, when you first started, how our sales representative had been obliged to restrict the sale of your lovely Chardonnay to us, even though, as she said we were the only ones with a clue about Peter Michael wines! The on-sale license bottles were sold to a local sandwich shop that had an on sale license. As your wines continued to improve in quality, your reputation grew. Prices have increased handsomely and today you're able to ask $70 a bottle for Chardonnay and more than $150 for a bottle of Les Pavots. Wine consumers don't just fall out of bed one day and start paying these lofty prices for bottles of wine. They are educated by shops such as ours, led by the hand to good, sensibly-priced wines and on up to more deluxe offerings. You can certainly turn your back to these sorts of establishments, but your ability to ask such premium prices is owed, at least in part, because we work diligently to cultivate this market. Your winery, like many other California vintners, seems to view wine merchants such as us as competitors. Top European vintners, on the other hand, with long range perspectives (both historically and to the future) view us as ambassadors. We have more contact with consumers and a longer history as a wine advisor than do most of the sommeliers in the various premier restaurants which you so highly favor. Further, most top wineries in Europe do not sell their wines directly to consumers. Our little wine emporium has been in its present location since 1961. As noted earlier in this letter, we've supported your winemaking enterprise since its inception, far longer than most of the premier restaurants listed on your web site. In fact, Aspen s Renaissance, Boston s Ambrosia on Huntington , Boulder's Dandelion, Cincinnati's Maisonette and Philadelphia's Ciboulette are still listed on your web site today, even though some closed more than 3 vintages ago! The life span of a bottle of Peter Michael Chardonnay is far longer than the life span of the typical fine dining establishment in this country. Happily, we don't rely on your wines for our livelihood. We appreciated having the wines in the shop and know some customers will be disappointed in not being able to purchase these here in the future. There are, however, many vintners around the planet, who do recognize the value we add to their wines. I must say, as well, I'm a bit disappointed you did not send your letter directly to me. Rather, you merely had your distributor make photocopies of your missive and hand them out to those accounts that are now deemed unworthy of purchasing your wines. I would think someone who wears the title of Sir, might have the integrity to send out such a letter addressed to the supporters whom you are now abandoning (at least for the present time to quote your epistle: Hey honey, I want a divorce, but if the new arrangement doesn't work out, I may return!). You put your distributors in a difficult position, asking them to take the slings and arrows from many customers upon whom they must count on for success. 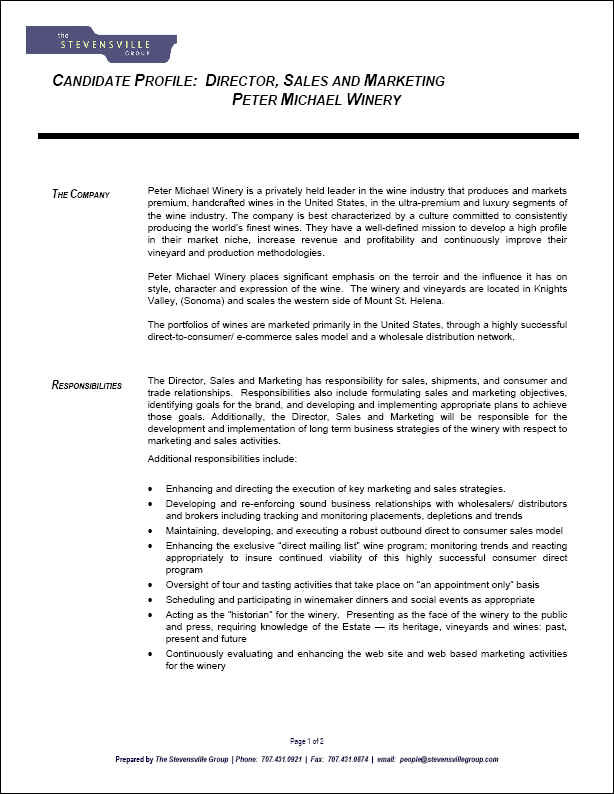 These firms still have to deal with their customers, even if they wont be selling them any Peter Michael winery wines. An article I've read recently dealing with the Codes of Chivalry covers various attributes of one possessing the title of Sir. Amongst these are Largesse, Humility, Faith, Courage and Loyalty. One might expect Sir Peter Michael to have a bit more of this last feature, especially towards those who have supported his enterprise right from the start. We wish Peter Michael Winery continued success in winemaking and hope they give greater consideration to those who helped make the winery a viable economic enterprise from the start! A customer told us he had been "fortunate" to get on the Peter Michael Winery mailing list. He's been a fan of the Les Pavots wine and wanted to buy two bottles from the winery. You can imagine his surprise when the release letter came and he was obliged to buy bottles of other wines in order to be "eligible" to buy the Les Pavots. "I ended up with about a thousand dollars' worth of other wines just so I could buy the wine I really wanted." he told us. Now you know how wineries sell wines...we are obliged to buy various wines to be "rewarded" with the more "in demand" bottlings. This is not a problem if all the wines are really good and in demand. A big envelope with a Peter Michael winery "newsletter" was accompanied by this missive...apparently these days, they have wine available for sale.